Since 1973, 57 Georgia DOT employees have died in work zones, but motorists and their passengers are actually more likely to be killed or injured in work zones, according to a news release. Since National Work Zone Awareness Week – an annual campaign sponsored by federal, state and local transportation officials – began in 1999, national work zone fatalities have decreased by 34 percent. According to the Federal Highway Administration, in 2013 there were 579 work zone traffic-related fatalities, 29,000 work zone injuries and 105 worker fatalities. All of the categories were decreases from the previous year. 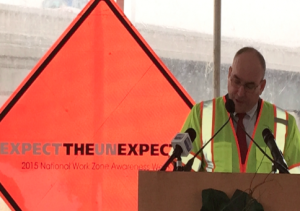 Last year the Georgia DOT had no employee work zone fatalities, but there were 20 total work zone fatalities. When going through work zones, drivers are expected to remain alert, minimize distractions, not tailgate or speed, pay attention to signs and obey road crew flaggers.